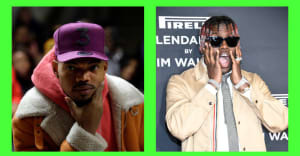 “The People’s Inauguration” will gather youth activists in Washington, D.C.
Fresh off receiving four nominations for NAACP Image Awards, Chance the Rapper will be tapped by the organization as a guest speaker at a January event in Washington D.C., following Donald Trump's inauguration. The 'People's Inauguration' is billed by the NAACP's Youth & College division as "a gathering of youth activists next month to organize and plan how to respond to new civil rights threats expected under a new administration and congress in 2017." Later on, the press release references the president-elect specifically, establishing "the goal to launch a new era of activism and protest against potential threats from the presidency of Donald J. Trump." The event also comes as part of a broader initiative, dubbed #StayWokeAndFight, which promises to face future threats to civil rights with "direct actions, protests, and other activism." Read the full release here.